Cutting Through Red Tape | Pacific Customs Brokers Inc.
"Red tape" is a derisive term for excessive regulation or rigid conformity to formal rules that is considered redundant or bureaucratic and hinders or prevents action or decision-making. It is usually applied to government, but can also be applied to other organizations like corporations. Red tape generally includes the filling out of seemingly unnecessary paperwork, obtaining of unnecessary licenses, having multiple people or committees approve a decision and various low-level rules that make conducting one's affairs slower, more difficult, or both. "Cutting through red tape...", providing solutions to our clients, this is the essence of what we do at Pacific Customs Brokers. With ever-changing importing and exporting regulations, an increased burden of responsibility for importers, and increasingly higher and more frequent monetary penalties for non-compliance, the team of customs and freight experts at Pacific Customs Brokers will take the time to understand YOUR movement of goods and provide time and cost-effective solutions. 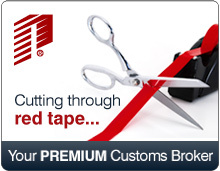 Pacific Customs Brokers is truly your premium Canadian and U.S. Customs Broker.